(Hong Kong, December 9, 2010) Anti-human rights forces and their allies have re-emerged to take control of key national institutions in Thailand and are digging in to fight for political control of the country, the Asian Human Rights Commission (AHRC) warned on Thursday. 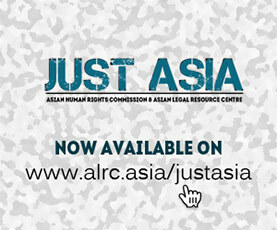 In its annual reports on human rights conditions in Asia released to coincide with International Human Rights Day, December 10, the Hong Kong-based regional rights group says that Thailand’s resurgent internal security state exhibits “an original authoritarian style, with more refined public relations and a sharper concern for new types of political and technological threats to its authority” than its predecessors. The regional rights group identifies its features as including “expanded use of emergency regulations to legitimate all state actions while also producing impunity; failure to meet obligations under international human rights law; the obfuscation of truth and curtailment of justice; and failure of the country’s human rights institutions to perform according to their mandate”. It expresses concern over the “eliminating of any middle ground in which citizens might express their views without fear of criminalization or violence”. The AHRC highlights the use of orders for people to turn themselves over for questioning under the emergency regulations imposed in response to the protests, which it describes as having “over many decades been associated with gross and widespread human rights violations in Thailand”. It recounts a number of cases of persons arrested and prosecuted under the emergency decree, including the case of protestor and political activist Sombat Boonngammanong, the case of a high school student initially ordered to undergo psychological assessment for participating in a small peaceful protest in Chiang Mai, and the case of Amornwan Charoenkij, a vendor arrested for selling flip-flops bearing the face of the prime minister and political messages. It also draws attention to how the emergency regulations in Thailand clearly violate international law and are contrary to its obligations under the International Covenant on Civil and Political Rights, which it points out, is consistent with the government of Thailand’s non-compliance with treaties and agreements to which it has committed itself. “Despite the persistent and flagrant violation of international law through application of these states of emergency, and notwithstanding the calls of human rights organizations, the UN Human Rights Council has remained mute on the rapidly deteriorating situation of human rights in Thailand,” the report states, noting that this is in part because Thailand’s ambassador to the council, an apologist for gross human rights abuses in his country, is currently the council chairman. The AHRC annual report also takes up a number of cases that are emblematic of the bad and worsening human rights situation in the country. These include the continuing struggles for justice of the relatives of disappeared human rights lawyer Somchai Neelaphaijit, victim of alleged police torture and killing during the war on drugs, Kiettisak Thitboonkrong; and Imam Yapa Kaseng, who died in a police vehicle parked at an army compound during March 2009. More than six years after the police abducted and presumably killed Somchai, the appeal cases remain pending and the one person found guilty of any offence in connection with the case is suspected of having faked his death, the AHRC writes. It also points to renewed threats by ultra-conservative establishment forces on the torture victims whom Somchai represented before his disappearance. “The case of Somchai Neelaphaijit and his clients is just one instance of how persons who have attempted to challenge the impunity of the police in Thailand have themselves ended up exposed and threatened,” the AHRC says in the report. “In every case where ordinary citizens and residents of Thailand have taken on the police that the AHRC has documented to date, in whatever part of the country, and irrespective of other factors, the police have escaped culpability and the victims have themselves been made to pay the price for their demands for truth and justice,” it adds. The report closes with sections on the performance of Thailand’s human rights commission as an anti-human rights agency, and with the crackdown on free expression in the country through the use of lese-majesty and computer crimes laws. “Independent voices and actors have been targeted in increasingly frequent, increasingly cynical and increasingly ridiculous criminal actions that are having the effect of greatly reducing the opportunities for sensible and informed debate on the serious problems that the country is facing, as well as pushing the judicial system further and further into a system for the pursuit of blatant political ends through superficially legal means,” the AHRC says. “In today’s resurgent internal security state of Thailand a peaceful protest from the middle ground may land the protestor in jail for at least seven years, and the establishing of a website for the voicing of independent opinion can risk the site director half a century of prison time,” it observes. “But to abduct and kill a human rights defender carries the prospect of no more than a year or two behind bars—if the perpetrator can even be brought to court—and the assault, torture and sharp-shooting in the name of the Kingdom of red-shirted protestors armed with catapults, fireworks, sharpened sticks and smelly fish is an act of bravery, deserving not of punishment but of promotion,” the report concludes damningly. Some extracts from the report follow. The AHRC has prepared similar reports for other countries throughout Asia, including the Philippines, Indonesia, Burma, Cambodia, India, Sri Lanka, Bangladesh, Nepal and Korea. During the week of 26 April 2010, the authorities claimed that behind the protests in Bangkok was a plan to overthrow the monarchy. The institution of the monarchy is a highly contentious one in Thailand, and in both the language of the Emergency Decree and other state rhetoric, is linked explicitly to national security. In addition to alleging that such a plan existed, the government released a diagram of uncertain authorship showing the alleged involved parties; the alleged participants were wide-ranging, with specific individuals, including former premiers and academics named, as well as broad categories such as the antigovernment protest group. The release of this diagram was a highly threatening action in an already extremely charged atmosphere. On April 27, Deputy Prime Minister Suthep Thaugsuban, in his capacity as Director of the CRES, said of individuals and entities named in the diagram, that in any cases in which there was sufficient evidence then an arrest warrant would be issued. If it were necessary, orders forbidding these individuals from leaving Thailand would also be issued. Mr. Suthep did not explicate how much evidence would be sufficient for a warrant, how it would be procured, or if its existence would be made public. At the same time, the Centre for the Resolution of the Emergency Situation (CRES), an agency that has been run out of an army base under the authority of the Internal Security Operations Command, began using the Emergency Decree to order citizens arbitrarily identified as dissident—or potentially dissident—to “report” themselves and submit to questioning by the authorities. Such arbitrary orders for interrogation and detention have over many decades been associated with gross and widespread human rights violations in Thailand, and their re-emergence into plain view during the violence in Bangkok speaks to the entrenchment of the internal security state in 2010, and the re-militarization of ordinary policing, security and administrative functions there. In 2010, most individuals received a written order to report the night before being required to go to the army base. Upon arrival at the base, they were typically questioned individually. Most were interrogated for 2-3 hours, although some sessions lasted for up to 6 hours. Many of the questions concerned the acquaintances of the person being interrogated, and if the person knew or was somehow connected to protest organizers. Some of those interrogated reported being asked about the planned activities of the protest movement and lectured about the purported illegality of the protests. The interrogators appear to have come from a variety of government agencies, including regular police, the army, and the Department of Special Investigation, Ministry of Justice. Individuals held under the decree have been subsequently charged with a variety of offences under the penal code, as well as with violating sections 9(1)(2) of the Emergency Decree, which prohibits gatherings of groups of five people or more, instigating unrest, disseminating information which might scare the public, or intentionally distorting information to create misunderstanding about the state of emergency to a degree that affects national security, public order or public morals. Some have already been sentenced to periods of one, two or three years’ imprisonment. The arbitrary nature of interrogations, arrests, detentions and charges under the emergency regulations has raised serious concerns about the risk of denial of liberty and abuse of state power in Thailand and point to the likelihood of further grave violations of human rights under the cover of the Emergency Decree and related analogous state security provisions in the coming years. The orders, like those to the police during the war on drugs and those in the context of counterinsurgency in the south of the country, placed officials outside of the ordinary legal system, denying citizens opportunities to question the circumstances of their detention and interrogation and thereby denying them means of redress in accordance with article 2 of the International Covenant on Civil and Political Rights (ICCPR). It is doubtful that the protests in Bangkok against which the state of emergency was invoked meet any of the criteria set by international law. Certainly they were threatening to the life of the government towards which they were directed; however, there is no evidence that the life of the entire nation was in any way at risk, and therefore the justification for the state of emergency under article 4 [of the ICCPR] was from the beginning at best tenuous. In any event, the government of Thailand has never taken any discernible steps in response to the recommendations of the Human Rights Committee concerning aspects of the Emergency Decree that are not in compliance with the ICCPR, and indeed it has not taken any discernible steps in response to any of the committee’s recommendations, as discussed below. Therefore, for the foreign ministry to claim that it is working within the parameters of the ICCPR through the Emergency Decree is patently false. Despite the persistent and flagrant violation of international law through application of these states of emergency, and notwithstanding the calls of human rights organizations, the UN Human Rights Council has remained mute on the rapidly deteriorating situation of human rights in Thailand. This is due in part to the fact that, perversely, the ambassador of Thailand to the Council took over its presidency in the middle of the year, having described the conflict in his country as “settled” (Bangkok Post, 29 June 2010). The new president of the Council is himself an apologist for the perpetrators of rights abuses. Since taking up the ambassadorship at the Human Rights Council three years ago Sihasak has denied the extent and systemic character of rights abuse in his country, as the AHRC already adverted to in its 2009 annual report. And in 2003, Sihasak was government spokesman during the infamous “war on drugs” of the Thaksin government. Sihasak described the operation, in which thousands of alleged dealers were extrajudicially killed, as being conducted “within a legal framework”. The perpetrators of killings during and after the “war” have never been brought to justice: the difficulties associated with bringing such cases against police and other persons involved in the killings are discussed below, with reference to killings in Kalasin Province, on which the AHRC has worked closely for a number of years. While various groups and individuals claim to be searching for the truth and justice for the victims of the political violence in Thailand during 2010, the elusive nature of truth and justice in Thailand even in far simpler cases that have been in plain view for a long time speaks to the enormous obstacles for victims and human rights defenders seeking answers and redress. The case of abducted human rights lawyer Somchai Neelaphaijit is in a great many respects emblematic of the institutional refusal to entertain seriously claims to truth and justice of victims of gross human rights abuse in Thailand. More than six years after police abducted Somchai and presumably killed him, his family still has obtained neither the truth—despite the fact that many state officials, including the former prime minister, Thaksin, appear to know what happened—nor justice. On 24 September 2010 the Criminal Court in Bangkok was scheduled to read out the verdict of the Appeal Court in the case against five police officers related to Somchai’s disappearance, in which one of the five, Pol. Maj. Ngern Thongsuk, was convicted of coercion—there is no offence for the forcible abduction and disappearance of a person in Thailand—and sentenced to three years’ imprisonment. However, Ngern appealed the sentence and obtained bail. In the meantime, on 19 September 2008 he mysteriously disappeared in an accident; his family has claimed that he is dead, but human rights defenders familiar with the case suspect that he may have faked his death and with the assistance of other police has changed his identity and gone into hiding, since his body has never been recovered. The Department of Special Investigation (DSI), Ministry of Justice has meanwhile failed to make any further progress into the case of Somchai’s disappearance, or the alleged police torture of his clients, Mr Makata Harong, Mr Sukree Maming, Mr Manasae Mama, Mr Suderueman Malae and Mr Abdulloh Abukaree. Indeed, the plight of these five men is indicative of the extent to which the criminal justice system works against the interests of victims of gross human rights abuse, even when giving the pretence of the contrary. Of the five, Sukree is still under detention charged with attempted murder, as he awaits a Supreme Court decision on his case. Another, Abdulloh, had been under the DSI’s witness protection programme, but when he returned to his home in Narathiwat Province he too was abducted, and he has not been seen since 11 December 2009. The lives of the others have all been deeply and irrevocably affected by the failure of the state to resolve the case of Somchai, or to bring their torturers to justice. Although the DSI presented an investigation report on their alleged torture to the Office of the National Counter Corruption Commission (NCCC), which subsequently called for more than 10 police officers to be investigated, instead of action being taken against the police, one of the remaining victims has instead himself been charged with making a false statement and is facing criminal charges. Pol. Maj. Gen. Chakthip Chaijinda lodged a charge against Suderueman for allegedly giving false information, but the Criminal Court rejected it. Now another case has been lodged and accepted, this time from Pol. Gen. Panupong Singhara na Ayutthaya, who in October 2010 was promoted to the post of deputy police commander for the entire Royal Thai Police. According to Suderueman, both Pol. Gen. Panupong and Pol. Gen. Chaktip were among the group who tortured him and the other four victims. The case of Somchai Neelaphaijit and his clients is just one instance of how persons who have attempted to challenge the impunity of the police in Thailand have themselves ended up exposed and threatened. In every case where ordinary citizens and residents of Thailand have taken on the police that the AHRC has documented to date, in whatever part of the country, and irrespective of other factors, the police have escaped culpability and the victims have themselves been made to pay the price for their demands for truth and justice. The cases of alleged forced disappearances and extrajudicial killings in the northeastern province of Kalasin during and after the so-called “war in drugs” in 2003 are indicative. Out of at least 28 alleged victims of police killings in this period, so far only the case of Mr. Kiettisak Thitboonkrong has reached court, thanks to the tireless efforts of relatives and supporters and due to the presence of an eyewitness who could verify that police denials of responsibility contradicted the facts on the night of his disappearance. Meanwhile, according to sources of the AHRC, the prosecutor has reportedly recommended that no charges be lodged against any officials over the deaths of 85 men during and after the protests outside the Tak Bai police station–78 in army custody–on the grounds that there is insufficient evidence to hold any one official culpable. This is despite the literally thousands of witnesses that could be called to testify, including over a thousand survivors and hundreds of state officers, and the existence of extensive video footage of the events, which clearly shows officials on the scene shooting, assaulting detainees, and forcing arrested men to lie face down with arms tied behind their backs first on the ground and then in the trucks in which they were transported to an army camp in another province, in which the 78 suffocated and died. The inevitable conclusion to be reached from all of this is that, in a case where the state officers do not actually want to investigate anything then of course there is no evidence to be collected or brought to court. When will the UN downgrade the NHRC? Since the time that the new National Human Rights Commission was established under the 2007 Constitution of Thailand in 2009, the Asian Human Rights Commission has called for its international standing to be downgraded and for its removal from participation in United Nations forums on grounds that it no longer complies with the minimum standards for national human rights institutions under the Paris Principles, whether in terms of process of selection of the commissioners or their composition. The commissioners include among them a senior police officer, two bureaucrats and a businessman whose sole contribution to human rights prior to appointment was to be named as a violator in a report of the previous commission. None of the commissioners have a track record of advocacy and promotion of human rights, and only one has any credentials to suggest himself to the body. It is therefore not surprising that the NHRC has failed to play a meaningful role to address any of the serious, persistent and entrenched obstacles to the enjoyment of human rights in Thailand, let alone any of the serious problems that it faced as a consequence of political violence in 2010. Whereas a functioning national human rights institution might have been expected to intervene to a maximum possible extent in the events of April and May, the abject failure of the extant commission to play any kind of meaningful role in these events speaks to what can only be charitably described as its irrelevance to the situation of human rights in Thailand. In fact, the only notable contribution of the NHRC at the time was for one commissioner to make a public statement to the effect that owners of businesses and other persons who had suffered losses due to the destruction of property could submit complaints to the NHRC and the commission would assist them to obtain compensation. Persons without property whose lives were lost or rights otherwise grossly violated in the course of the violence and subsequent crackdown on anti-government protestors were apparently not within the commission’s narrow range of vision; nor do they appear to have fallen within it at any time since. As the political situation in Thailand has become more polarized, not only have state agencies pursued persons perceived as threats to the established order but also persons occupying the middle ground, ultimately with the effect that any middle ground is itself being eliminated. Independent voices and actors have also been targeted in increasingly frequent, increasingly cynical and increasingly ridiculous criminal actions that are having the effect of greatly reducing the opportunities for sensible and informed debate on the serious problems that the country is facing, as well as pushing the judicial system further and further into a system for the pursuit of blatant political ends through superficially legal means. Almost immediately after the state of emergency came into effect on April 7, the authorities responsible for its enforcement issued orders to block and shut down some 36 websites. Most belonged to or were closely aligned with the anti-government protestors, but among them were the independent news and commentary sites Prachatai and Fah Diew Kan (Same Sky), and its affiliate. An attempt by Prachatai to launch a legal challenge to the block of its site and claim damages was thrown out of court without even a single witness being examined on the ground that the block was in accordance with the ample terms of the Emergency Decree. At time of writing, some of these sites are partly or fully operating, or are operating on mirror sites. Some can be accessed outside Thailand, but not in the country. Persons in Thailand attempting to access not only the main sites of these groups but also archived contents on third party sites are met with a message indicating that the contents are informed that access to the information at the address has “temporarily ceased” under the Emergency Decree. As the AHRC wrote in its 2009 report, the director of Prachatai, Chiranuch Premchaiporn, has been made the subject of a series of criminal cases under the Computer Crimes Act and also for lese-majesty under the Criminal Code. On the afternoon of 24 September 2010, immigration police at Suvarnabhumi Airport suddenly detained Chiranuch, who was just returning to Thailand from a conference on Internet freedom. After being detained, she learned that she was to be taken to Khon Kaen province, in the northeastern part of Thailand, in response to a warrant issued by police there. However, the arresting officers declined to tell her the nature of the charges against her. After being driven to Khon Kaen, interrogated and formally charged, she learned of the charges and was released on bail. She must report back at the same police station monthly. Her trial will begin in February 2011 and she faces a possible total sentence of 80 years’ imprisonment. Meanwhile, Prachatai has been forced to shut down its web chat board to avoid possible further charges against its staff or persons using the site. The lese-majesty charges against Chiranuch were made not over anything that she herself did but for her failure to remove comments that were posted to the site that she manages. These comments, which the AHRC has seen, are not of a violent or threatening manner. What appears to be the crime of the author, rather, is that he or she writes about the institution of the monarchy and specific individuals within the institution in an informal and intimate fashion. Using slang words to refer to the institution as well as specific individuals within it, and coarse words to describe their actions, the author of the comments questions the forms of power exercised by and involvement in politics of the institution. Rather then preserving the distance and untouchable hierarchy between the ordinary citizen and the institution, the author writes about the members of the institution as if they too are ordinary, and subject to observation and criticism. That she has been singled out because of the character of the website has all along been obvious, and even more so given that Internet service providers hosting sites with allegedly anti-monarchy contents—which have increased dramatically in number in recent times—have not also faced charges but have been asked to cooperate with the government. On the other hand, in a surreal extension of the same principle used to charge Chiranuch and a further sign of the resurgent internal security state, Meechai Ruechupan, an ultra-conservative senior lawyer who has been close to successive military regimes in Thailand and was among the drafters of the regressive 2007 Constitution, reportedly recently told journalists that a petrol station owner who knowing about anti-monarchy graffiti in his toilet failed to remove it could also plausibly be prosecuted for lese-majesty.